Founded in 1991, the Mission of NIC is to advance the quality of senior housing and care by facilitating informed investment decisions through best-in-class date, research, networking events and professional education. The California Assisted Living Association represents Assisted Living providers in California. Members of ASHA are executives involved in the operation, development and finance of the entire spectrum of senior housing. 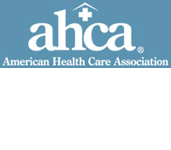 AHCA is a non-profit federation of affiliate state health organizations, together representing more than 11,000 non-profit and for-profit nursing facility, assisted living, developmentally-disabled, and sub-acute care providers that care for approximately one million elderly and disabled individuals each day. The work of LeadingAge is focused on advocacy, leadership development, and applied research and promotion of effective services to seniors, children, and others with special needs. Argentum is a national association dedicated to supporting companies operating professionally managed, resident-centered senior living communities and the older adults and families they serve. Aging2.0 supports innovators taking on the biggest challenges and opportunities in aging.